In some business scenarios, it may be desirable to include additional security measures to protect information. To do this, Bizagi provides functionality to encrypt information in the database (for specific attributes). •When there is very sensitive data that must be hidden from unintended users, particularly if many users have authorized access to the database and its information. •When you are integrating external data sources into your project (through Virtualization and Replication), and you wish to provide that extra security protection for the local information stored at Bizagi. Encryption of information at the database is carried out by Bizagi through encryption algorithms configured by your project. This section describes how to use this feature called Database encryption. The possibility to encrypt specific database table columns is not targeted for cloud environments given that these environments already implement full encryption for data at rest. To enable database encryption, you will need to specify a key (for example, a 32-character GUID) for the encryption algorithm. This key is stored in a file on a physical path which has restricted access; only you will know the location of the file. Bizagi will use the hashing algorithm of your choice to generate this key in bits for the encryption algorithm. You will also need to specify which encryption algorithm to use. Choose SHA2 256 for the highest security conversion. Choose SHA1 if you don’t want performance to be penalized by a more sophisticated conversion procedure. •AES (recommended), either using 128, 192 or 256 bits. The defined key is solely under your control and custody, and thus duly protected. Consequently, you alone are responsible for the storage, safekeeping and protection of the key, and for restricting access to it. For this reason, you should have contingency plans or a backup in case the key is lost, as encrypted information is not recoverable in any circumstances by Bizagi without it. Follow these steps to configure database encryption. By default, users are not authorized to configure database encryption. In order to utilize this feature, you will need to make sure that the business administrator user is explicitly authorized to configure the necessary parameters for encryption (such as the algorithm and, most importantly, the key used in the encryption). 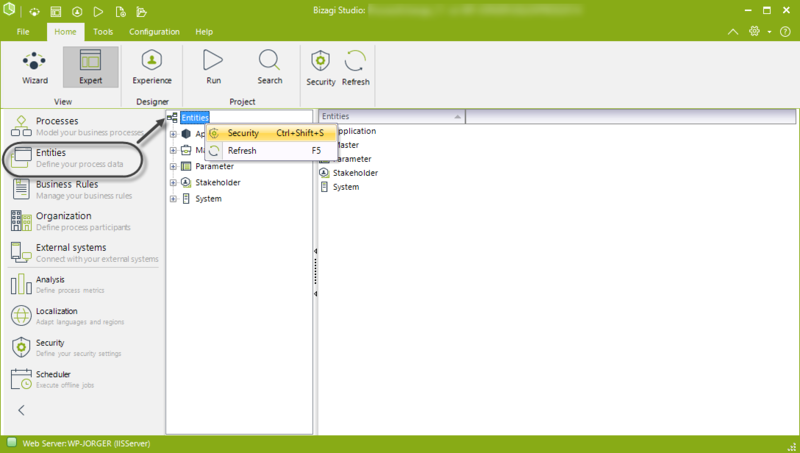 To authorize users, first open your project through Bizagi Studio. Once in your project, there are two different ways to grant a user access to this feature: by setting the user up as an administrator, or by specifically allowing a user to use database encryption. First option: by setting the user up as an administrator. This option will enable the user to use the database encryption feature as well as delegate the privilege to other users. 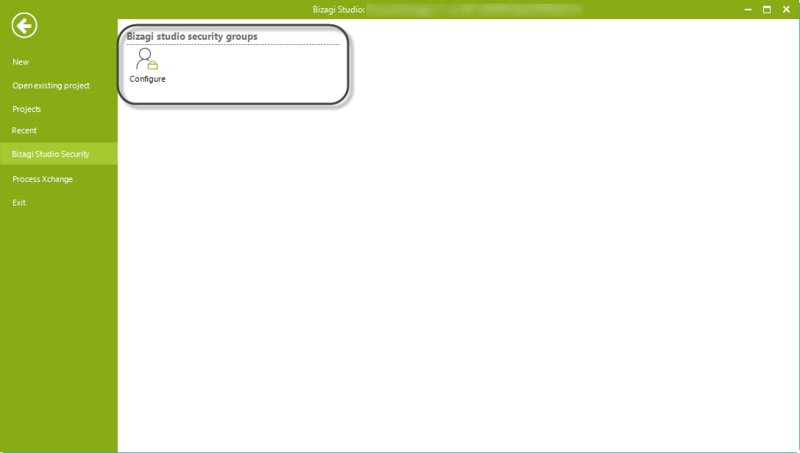 1.Navigate to Bizagi Studio Security module by locating the File tab and then Bizagi Studio Security. 2.Click on the Configure option. 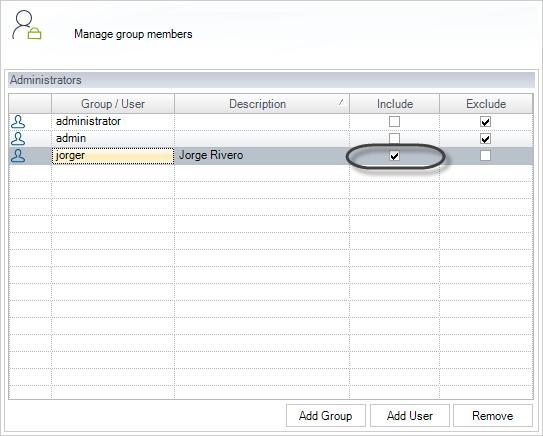 3.Add the user to the Administrators group by clicking on the Add User button. 4.Make sure you tick the Include checkbox to specify that this user will have administrator privileges. 5.Click Close to apply the changes. 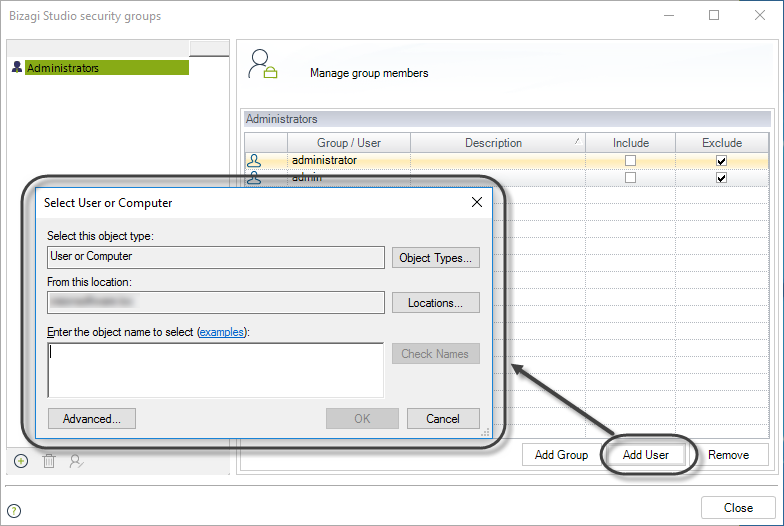 You may also choose to add a group to the Administrators group by following the same steps taken previously but using the Add Group button instead. Second option: by specifically allowing a user to use database encryption. This option will allow the user to configure database encryption options. 1.In the Expert view, select the Entities module. 3.Add the user by clicking on the Add user button. 4.Click Close to apply the changes. Follow the steps below to configure the hashing and encryption algorithms, and the encryption key. 2.1 Define a key for the encryption algorithm to use and save it into a plain text file. Make sure this file is saved in a network-available location with restricted access. 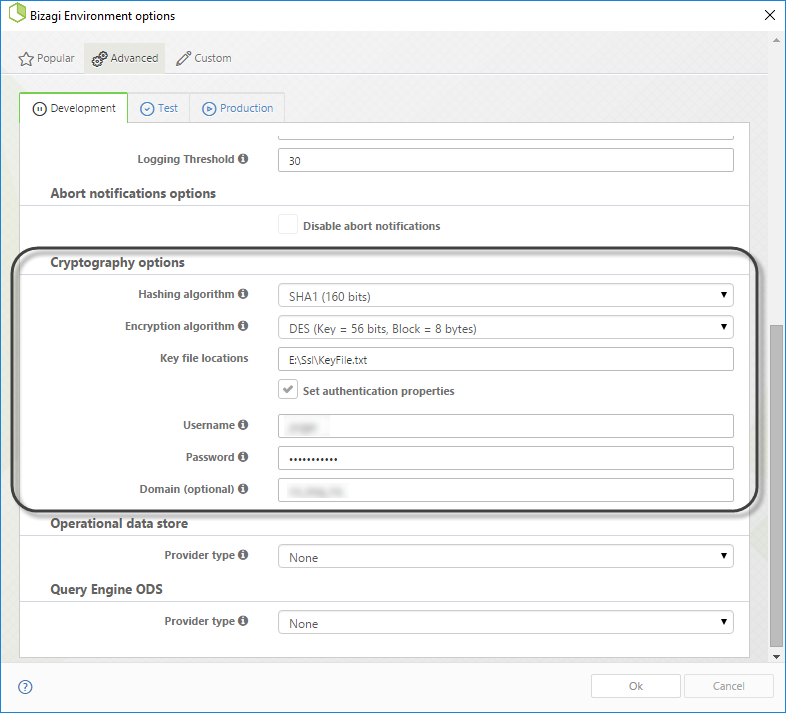 2.2 Enable database encryption in Bizagi. 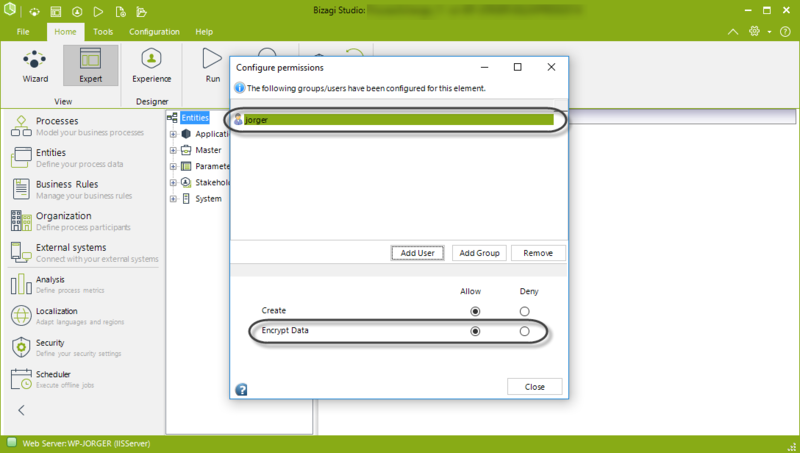 To do this, open Bizagi Studio and select the Environment option located in the Configuration tab. 2.3 Select Advanced tab and then scroll down to Cryptography Options. Keep in mind that these options will only be displayed to users explicitly authorized to configure this feature (as described in the first step). Select the hashing algorithm used to convert the key into bits. Available algorithms are: SHA1, SHA2 256. Note that SHA2 will use 256 bits (as opposed to the 160 bits used by SHA1), thereby creating a more dispersed definition of the key (more secure). Select the encryption algorithm that will use the key you’ve set to encrypt information. •AES (recommended) either using 128, 192 or 256 bits. Specify the location of your key file. •A local path of the Bizagi Server. To specify valid credentials to access the key file, tick this checkbox. •For the configuration: the logged credentials of the Bizagi Studio user. •During runtime: the credentials used by the Bizagi Server (i.e, in IIS, the identity defined for the application pool). (applies when the set authentication properties is marked). 2.4 Click OK to apply the changes. Once you have set the encryption algorithm and its key, you may mark which attributes you want to set as encrypted information. Bear in mind that the encryption of attributes can only be performed to parametric and master entities. In order to explain how to set or add an encrypted attribute, the process we created earlier, My First Process (Vacation Request Process), will be used to illustrate this step. We will assume that the number of days available will be an attribute that can only be viewed through the work portal. This then will be the business condition that makes it necessary to set Availabledays as an encrypted attribute. 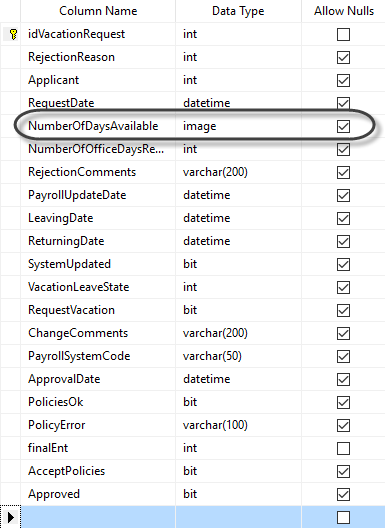 This is an undesirable situation because NumberOfDaysAvailable will be an attribute that must only be viewable through the work portal. 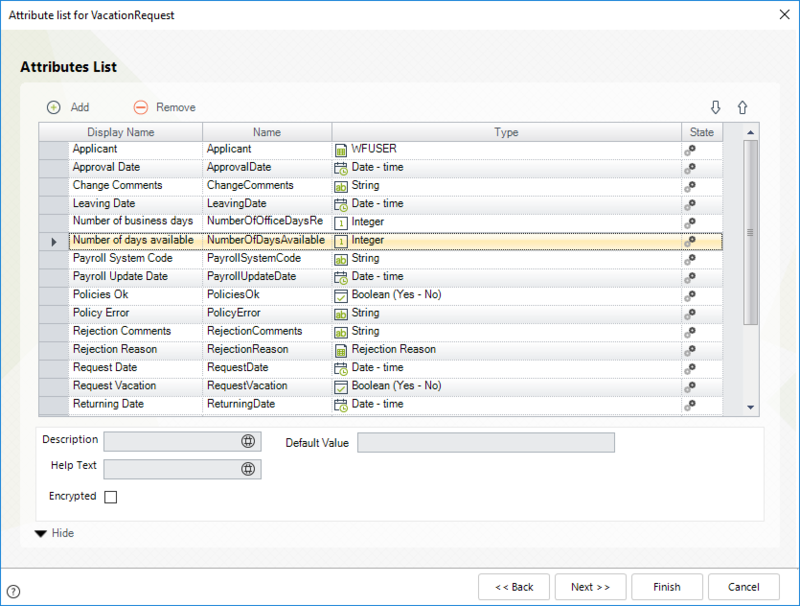 As it stands, the attribute can be queried by any SQL Editor that has a connection to the database. 1. 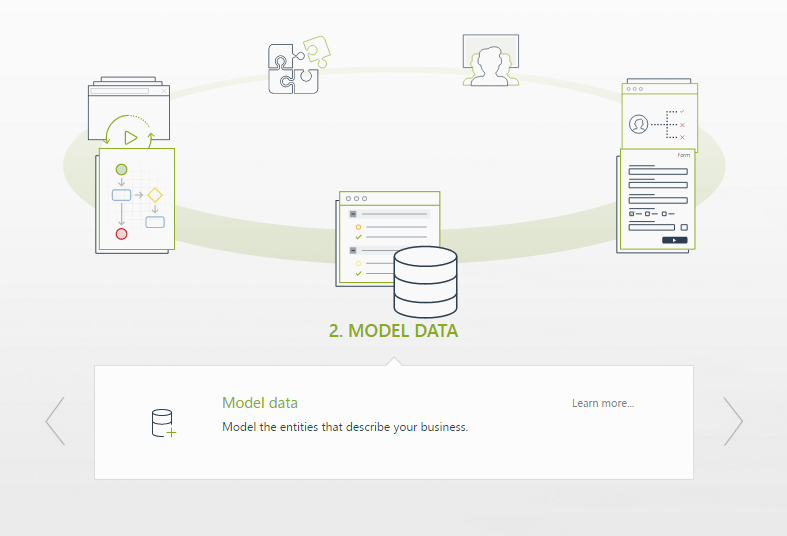 Go to Step 2 of the Wizard called Model Data. 2.Right-click on the entity where the encrypted attribute will be set or added, and select the option Edit Attribute List. 3.The Attributes List for the entity will be displayed. Select the required attribute to be set as encrypted. 4.Tick the Encrypted option. This will hide the attribute’s Default Value property, and Localizable property where pertinent. 5.Click Finish to save and apply the changes. When adding attributes to the list, the option to encrypt them will be allowed only when the individual types selected are available to be encrypted. The attribute NumberOfDaysAvailable was an int type before the Encryption process and now it is an image type. Most importantly, the data is not visible to the user logged in. The example above was created using a SQL Server Database; the data type in an Oracle database would be BLOB. Take into account the following considerations when using this feature. 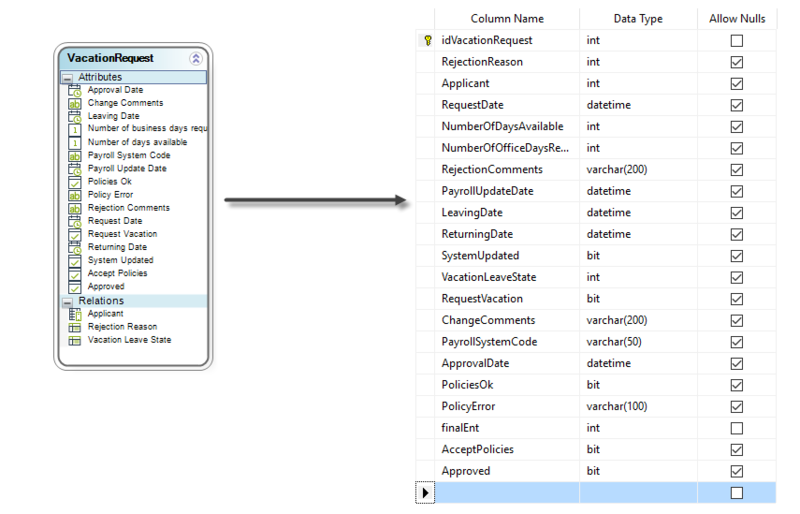 Note that database encryption is available for attributes of Master or Parameter entities. This means that you may not encrypt user properties of the WFUser entity, or any attributes of System or Application entities. 2.Not all types of attributes can be encrypted. 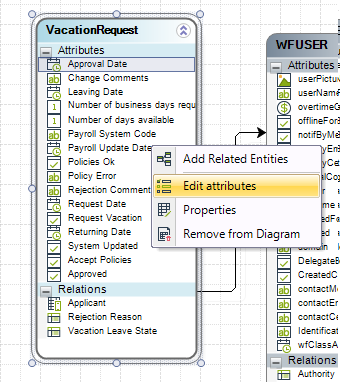 Other attributes such as files or images, are already by default not readable through the database. 3.Encrypted attributes for end users. •They are supported in Bizagi queries when they are used as part of the results. Not supported as filters. •They are supported in Search controls when they are used as part of the results. Not supported as filters. 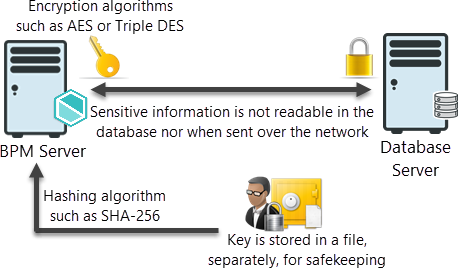 Database encryption does affect performance when used in Combo-boxes that display information bound to external data sources. Therefore, carefully consider and evaluate your UI design and use of this feature when needed. Once that an attribute using the database encryption feature has been deployed to a Production Environment, it will be not possible to reverse the use of this feature. This means that you may not activate this feature for an attribute which is already working in a production environment without it, nor deactivate it for an attribute which has this feature active and working in a production environment. 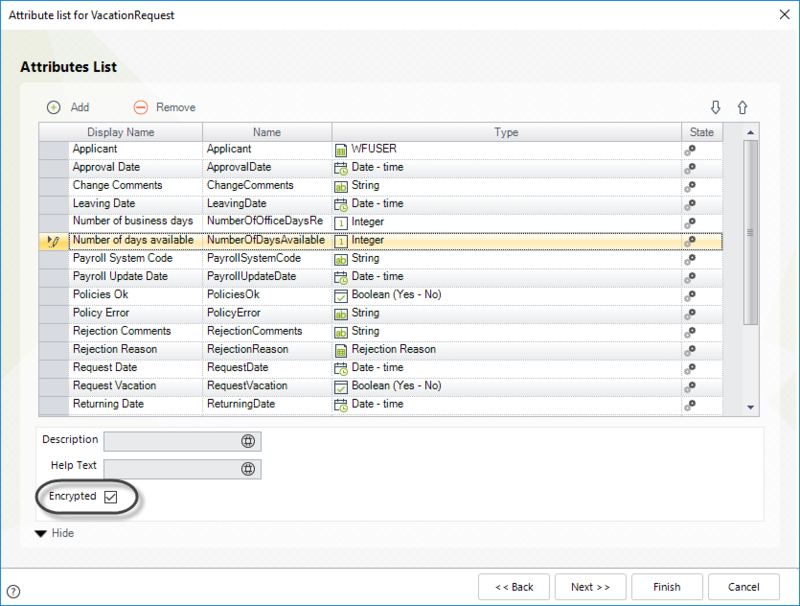 In case you need to either start or stop using this feature, you will need to create new process versions and make sure that your process data model uses a new different attribute.